What is an Argo Float? 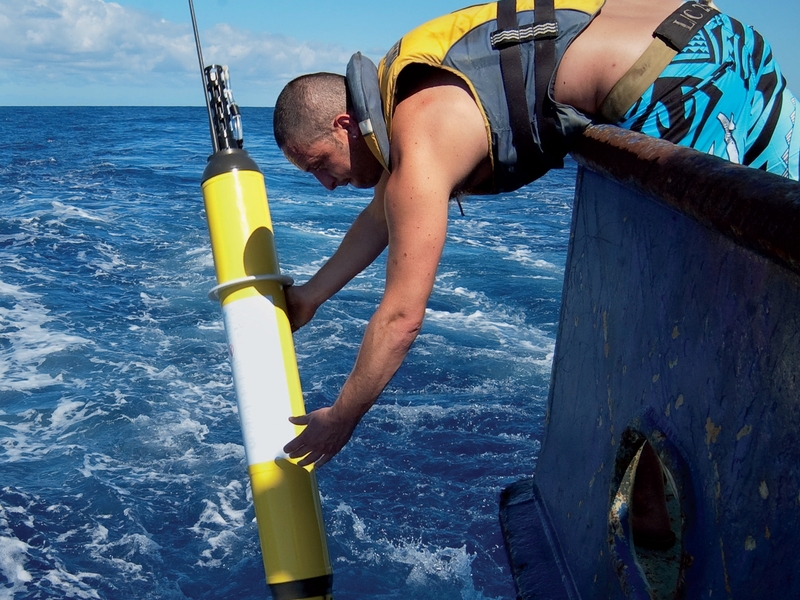 Argo Floats are robots that float at different depths in the sea collecting information. They surface every 10 days and send their data about temperature and salinity to a satellite. is able to send information to a satellite. *Note that changes in technology now allow the Argo Float to send data to satellites in 20 minutes rather than several hours. This means it has to spend less time on the surface where bad things can happen to it eg getting hit by other floating objects. This 10 day up-and-down is called a 'cycle'. At the end of every cycle the Argo Float sends its information to satellites. This information is called a 'profile'. 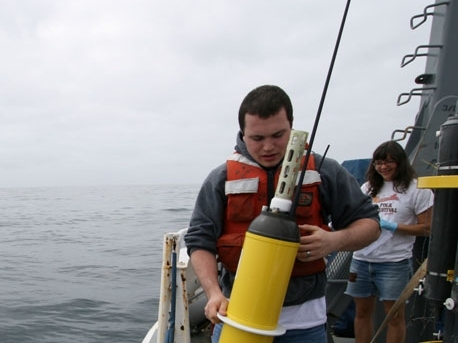 How do Argo Floats measure the ocean? A fun and quirky YouTube video animation that explains what an Argo float is, how it operates and how the data helps us understand ocean circulation and climate. Note that 1decibar (db) is equal to 1 metre of depth. So 1,000db is about 1,000m below the sea surface. While the Argo Float is on the sea surface it sends its information to a satellite. This information is called ‘data’. The data uploaded to satellites is collected while the Argo Float travels from 2,000m underwater to the surface. The data describes a 'profile' of the ocean. That means it shows the changing temperature and salinity as the Argo Float rises to the surface. Over a million Argo Float profiles have been uploaded since the first Argo Float was deployed in the year 2000. Have a look at the image on this page of a typical Argo Float profile. The position of the Argo float tells us how far it has moved since the last time it came to the sea surface. The position is given as latitude and longitude. 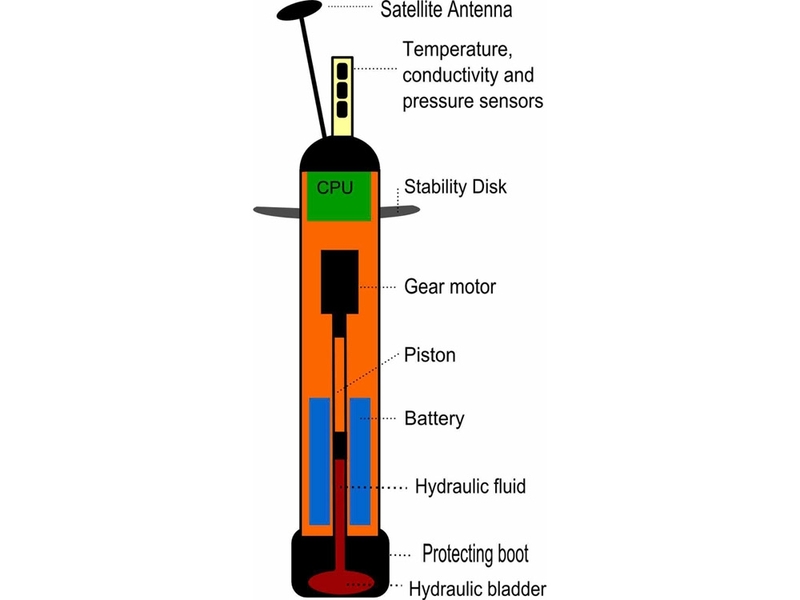 Regular Argo Floats are the ones described above. They are steel cylinders about 1.2m long and weighing about 25kg. They are designed to be strong enough to descend to 2,000m below the surface of the sea. At a depth below 2,600m they will crush and be destroyed. Deep Argo Floats are designed to go down to depths as far as 5,000m. The pressure at this depth is 2.5 times greater than at 2,000m where Regular Argo Floats descend to. Deep Argo floats are glass spheres not metal cylinders. A sphere is able to withstand much greater pressure than a cylinder. The voyage of the RV Tangaroa in June 2014 will test the new Deep Argo Float. An Argo Float ready for deployment. An Argo Float being deployed over the side of a ship.